At the heart of Huntley Meadows Park is the 50 acre Central Wetland. This is the largest freshwater wetland in Fairfax County and one of the largest in the region. The Central Wetland, located along the Barnyard Run wetland complex, is part of a much larger wetland complex encompassing hundreds of acres of freshwater marshlands (see Figure 1). Freshwater wetlands harbor the greatest biodiversity of any habitat type in temperate climates and are considered a rare habitat in the Washington D.C. region, making the wetland complexes at Huntley Meadows Park a natural treasure. Dogue Creek has a 19.4 square mile watershed and forms the western boundary of Huntley Meadows Park. A large portion of this wetland complex lies within the Dogue Creek Watershed. The Central Wetland at Huntley Meadows Park is located along the Barnyard Run wetland complex which is a tributary of Dogue Creek (see Figure 1). In 2004, the first Northern Snakehead fish (Channa argus) was accidentally caught by a bass fisherman in Little Hunting Creek, a tributary of the tidal Potomac River. 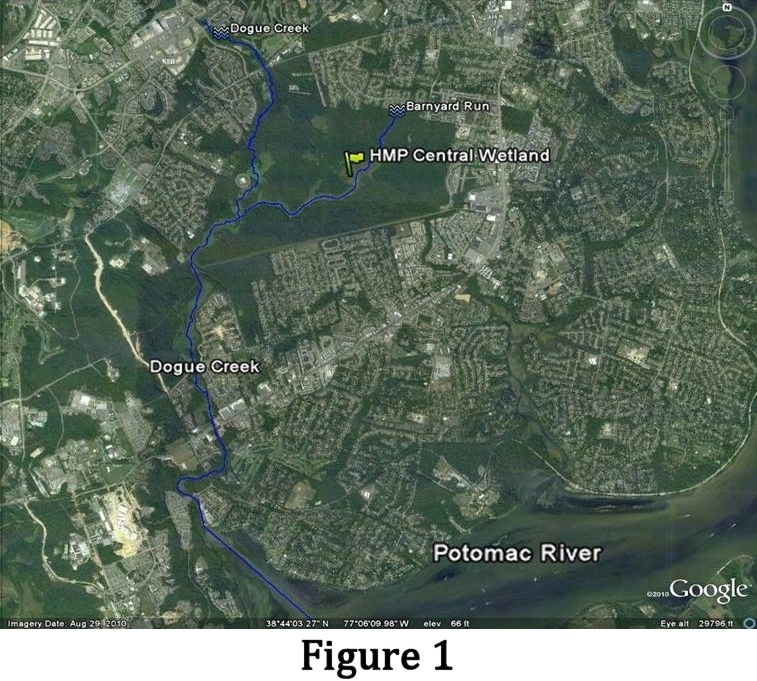 That year, 20 more Northern Snakeheads were caught in the main stem and tributaries of the Potomac River and at least 9 of those fish were caught in the tidal section of Dogue Creek. In October of 2005, two men fishing along Dogue Creek near the Route 1 overpass, about a mile and a half downstream of Huntley Meadows Park, caught more than 80 young snakeheads heading up the non-tidal section of Dogue Creek during a flood event. Once Northern Snakeheads were found in the non- tidal sections of Dogue Creek, Huntley Meadows Park staff became very concerned and took action to try and protect the Central Wetland from invasion. With their voracious appetites Northern Snakehead fish could wreak havoc on the large populations of amphibians, reptiles, birds and mammals that make Huntley Meadows Park their home. In 2006, the Resource Management staff at Huntley Meadows Park requested staff from the Watershed Planning and Assessment Branch of the Department of Public Works and Environmental Services (DPWES), to conduct an electro-fishing survey of Dogue Creek at the southern tip of Huntley Meadows Park (see Figure 2 for survey locations). Electro-fishing doesn’t kill the fish but renders them immobile for several seconds; this enables staff to net, identify and count the fish before releasing them. 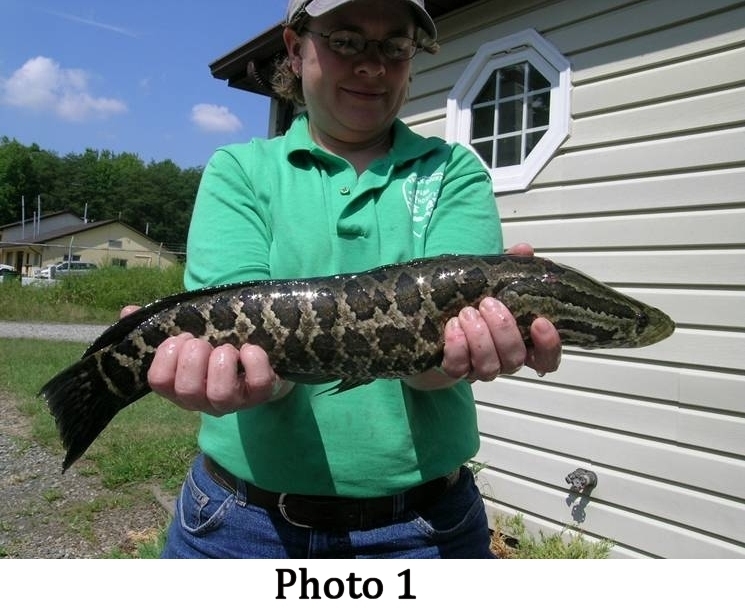 With this survey, staff attempted to determine if Northern Snakehead fish had made the mile and half migration up the creek from the Route 1 overpass to the southern park boundary. Unfortunately, one 17” Northern Snakehead fish was caught (see Photo 1) inside Huntley Meadows Park just as the shocking crew was finishing for the day (see Chart 1 for survey results). Although just one fish was caught, it was evident that Northern Snakehead fish had made the long upstream migration and were only about one mile below Huntley Meadows Park’s Central Wetland. In 2007, staff decided to conduct another electro-shocking survey in Dogue Creek at Wickford Park which is about one mile upstream of where the 17” snakehead was caught (see Figure 2 for survey location). The survey was intended to determine if the Northern Snakehead fish were continuing their migration up the creek. This section of the migration would be much tougher due to shallow wetlands that periodically dry up as well as multiple beaver dams that impede migration. Thankfully no snakeheads were captured in 2007 or in 2010 when another shocking survey was conducted (see Chart 1 for survey results). Although none were found in the recent stream surveys, park staff and visitors have snakehead fish in the Central Wetland. One small fish was seen during the summer of 2009 and three more small ones were seen in 2010. Three of these fish were caught by the park manager with a net and they measured 10”, 6” and 5” in length. One was wounded, possibly by an osprey, heron or egret. Two of these fish were very young indicating the snakehead fish are either reproducing in the park or immigrating into the wetland from Dogue Creek. A rudimentary seine net survey was conducted in the Central Wetland during the summer of 2010 and no snakehead fish were captured. Two large snakeheads were seen in the central wetland by volunteers andpark patrons alike during the spring of 2011. Initial attempts by staff to catch them using a net were unsuccessful. The DPWES electro-fishing tesam was calledand requested to come donw and shock a couple of areas where the snakeheads were being observed. 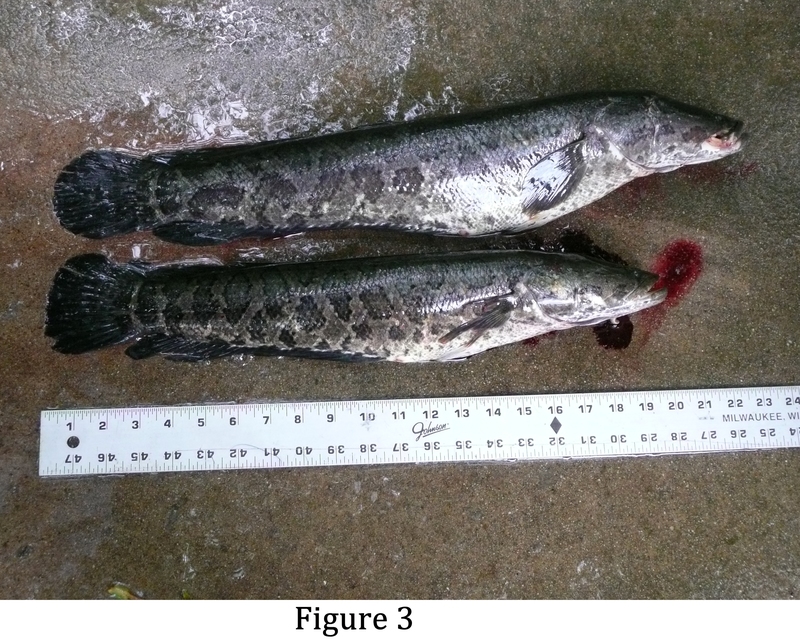 Within the first hour of shocking the DPWES team had caught two large snakeheads in the central wetland measuring 20” and 25” (see figure 3). Both fish were killed and stomach contents examines for remains. One snakehead had a medium size goldfish (Carassius auratus) in its stomach and the other fish had a small fish or tadpole in it. Both of these large fish were females full of eggs. The typical breeding season for snakekeads is spring although they appear to be able to breed throughout the warm season up to five times per year. 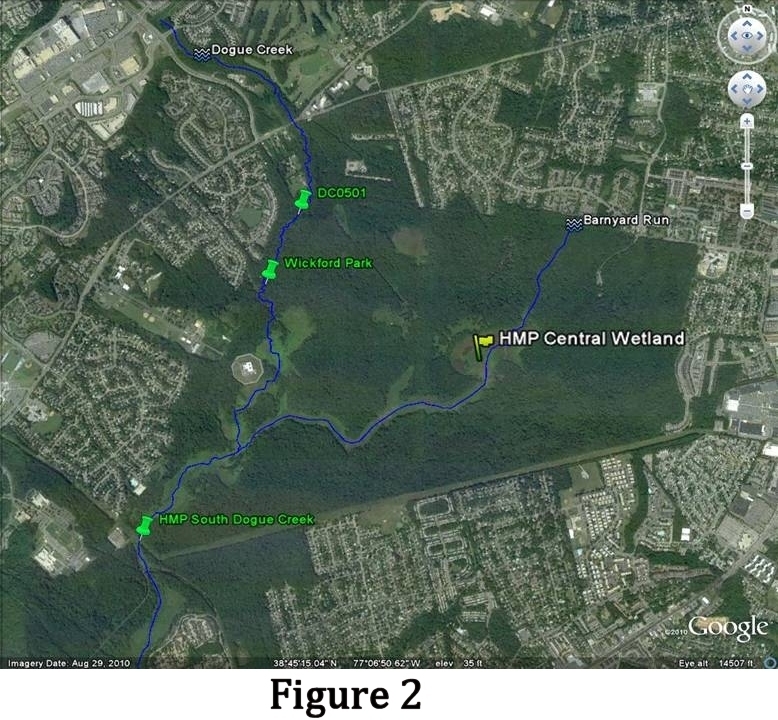 DPWES has been conducting electro-fishing surveys for over ten years in different sections of Dogue Creek along the western boundary of Huntley Meadows Park. Results from all those surveys are located in Chart 1 below. The data varies considerably due to many factors including depth of water along the survey stretch, turbidity of the water, debris and beaver damming along sampling section, abilities and experience of the netting crew and the time of year surveys are conducted. On several occasions the water was somewhat turbid but surveys were conducted since staff was already on site. Surveys conducted under these conditions often make it difficult to see fish in deeper pools and typically reduce the number and diversity of species in the data during that specific survey. Typically surveys are conducted in August when water levels are low. However, several surveys have been done later in the year at the request of Fairfax County Park Authority staff.